Tubes, tubes, and more tubes! 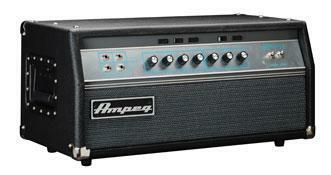 The new Ampeg SVT-VR is a vintage reissue of an early 1970s "Blue-Line" SVT head. The preamp stage, power section, and even rocker switches emulate the exact signal path, tone, and vibe of the original rock 'n'roll workhorse. Authentic from its input jack all the way to its six 6550 output tubes, the SVT-VR is a must-have for rockers seeking that in-your-face Ampeg bass tone. Speaker Connections: Neutrik Speakon® and 1/4"